In order to realize a vision of a community that is built for people, not for cars, we need a high quality regional transit system. 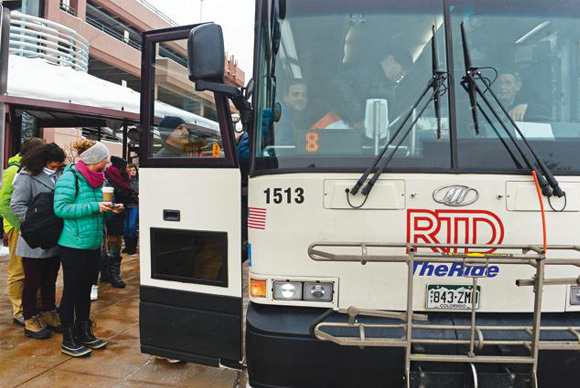 It is essential that the bus rapid transit (BRT) line along US 36 provide great service both to the Broadway corridor and to Boulder Junction. With this context, there is one major problem we would like to highlight in the fare study recommendations – the treatment of light rail compared to the treatment of BRT. The fare study recommends that light rail fares be set at $2.60 regardless of distance, while recommending that regional bus fares (including 36 BRT) be set at $5.50. This means, for example, that a rider boarding the SE rail line at the Lincoln Station and riding to Union Station (or from Ridgegate in Lonetree when the SE extension is completed) would pay less than half what a rider boarding US 36 BRT at the Table Mesa Station and riding to Union Station would, despite the fact that the trips are comparable in length. This is highly inequitable. Most people consider light rail a premium service, yet it would be offered at less than half the price of BRT for a comparable trip. And given the public perception around the delays to NW rail, this just feeds the perceptions of regional inequity in the northern metro area. And it will tend to depress ridership on BRT compared to rail. Using data from the same report, the ratio of farebox revenue to operating costs is 46% for regional routes versus 12% for light rail, meaning fares cover 46% of the operating cost for regional bus service, but only 12% of light rail operating costs. And, using the same report we can ask what the actual “effective fare” is- that is, the total farebox revenue divided by the number of riders. This will be less than the fare, as some riders pay discounted rates, there may be fare evasion, etc. The total fare revenue/trip is $4.00 per rider for regional bus versus$.82 per rider for light rail. So already under the current fare system regional bus has a lower subsidy/trip, a higher farebox cost recovery, and generates more fare revenue per rider than rail, but the proposed changes will increase the fare for regional BRT trips by 10% while cutting regional light rail fares by nearly 50%! US 36 BRT is a FasTracks service, on a par with all of the rail lines (except much cheaper to build!). It should be treated equitably with other FasTracks services, if the fare for regional light rail is set at $2.60, the fare for US 36 BRT should also be $2.60. One might worry about foregone revenue. However, foregone fare revenue from this change to BRT is very small compared to the foregone revenue from the proposed change to rail fares. In 2013, there were 23.7 million rides on rail; 10% were regional, 43% express, and 47% local. Thus, the current proposal would drop fares from regional to local for 2.4 million rail trips and from express to local for 10.2 million rails trips, compared to a total of 600,000 BX/BMX trips in 2013, If fare changes from the draft proposal must be kept revenue neutral, US36 BRT and light rail fares could both be set at $2.70 rather than $2.60 to generate the same total fare revenue for RTD. US 36 BRT service will be launching in 2016 as the first BRT line in the RTD system. It is very important that this be a successful launch, in order to both address public concern over the fact that NW rail is not going to be built (at least in any near or mid term time horizon) and to build support for future BRT services across the district. Making the regional fare have parity with the new light rail fares will help to drive ridership and make the service rollout a success.